Duane Michals Lecture October 25, 7:00pm, Cincinnati Art Museum. This event is co-sponsored by Carl Solway Gallery and the Friends of Photography at the Cincinnati Art Museum. Alan Rath’s kinetic sculptures poetically integrate the human and the technological. Many incorporate computer-animated still images of human features, such as eyes, mouths and hands, displayed on LCD screens. These screens are mounted on sculptural armatures and the images are programmed to change in subtle progressive permutations. The screen images often appear to be involved in some form of communication. 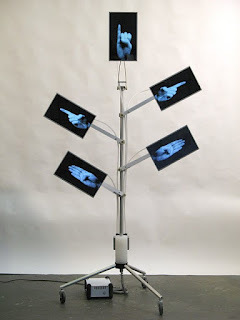 For example, in the sculpture Bostock, 2012, five LCD screens each display an image of a single hand. The hands engage in sign language that translates the lyrics of Jethro Tull’s 1972 album, Thick as a Brick. The title refers to Gerald Bostock, the fictional eight-year old boy Ian Anderson credited with writing an epic poem upon which the album was allegedly based. The lyrics were actually written by Anderson. As a teenager in Cincinnati, Rath attended his first rock concert – Jethro Tull – with Carl Solway Gallery director, Michael Solway. At this young age, Rath was already building his own speakers and other electronics. The exhibition at Carl Solway Gallery will include eight LCD screen sculptures created during the last ten years. The exhibition will also include several of Rath’s recent explorations in robotics. Originally trained at MIT as an electrical engineer, he is one of the few visual artists who designs, builds and programs all aspects of his work. Alan Rath’s contributions to the field of contemporary sculpture and new media have received significant acknowledgement worldwide. His work is included in such major collections as the San Francisco Museum of Modern Art, the Whitney Museum of American Art (New York), the Walker Art Center (Minneapolis, MN), the Cincinnati Art Museum, the Los Angeles County Museum of Art, and the Hara Museum (Tokyo). Born in Cincinnati in 1959, he lives and works in the San Francisco Bay Area. His exhibition at Carl Solway Gallery will feature five of his most celebrated sequences including the twenty-seven panel piece, The Journey of the Spirit After Death from 1970. Michael Solway first encountered this work in the Kolumba, an art museum in Cologne, Germany located on the site of the Church of Saint Columba and run by the Archdiocese of Cologne. Seeing these prints in the stairway of this building, a modern museum sharing its site with an ancient church bombed during World War II and a lower level of catacombs proved unforgettable. In 2012 Michals began painting on tintype portraits. An historical process from the Civil War era, tintypes are photographs printed on thin metal sheets. In this work, he combines painting and photography, 19th century portraiture with 20th century Modernist references. The exhibition will include nine of the painted tintypes and several recent films, Talking Pictures. In these short films, or ‘mini-movies” as Michals refers to them, he wrote directed and sometimes acted in this new work displaying his ever-evolving innovative and whimsical spirit. Duane Michals, Deja Vu, 2012, tintype with hand-applied oil paint, 6.25 x 8.25 inches. Duane Michals was born in McKeesport, Pennsylvania in 1932 and lives and works in New York City. His work has been featured in countless exhibitions over a period of over fifty years. A major retrospective, Storyteller: The Photographs of Duane Michals was organized by the Carnegie Museum of Art (Pittsburgh) in 2014. Michals had a solo exhibition at Carl Solway Gallery in 1980. His photographs are included in at least 50 museum collections in the United States and over 30 museum collections abroad. He is the subject of two feature length films, Duaneland (2004) and The Man Who Invented Himself – Duane Michals (2013). Although Alan Rath and Duane Michals represent different generations and work with different mediums, they share preoccupations with images of the human body, the passage of time, movement, rhythm and a sense of humor. Both exhibitions are held in conjunction with the FotoFocus Biennial 2016, a regional, month-long celebration of photography and lens-based art held throughout Cincinnati and the surrounding region that features over 60 exhibitions and related programming. As part of the Biennial, participating venues respond to the theme: Photography, the Undocument. Visit us at booth number 516.